The University of the Philippines Los Baños is pleased to announce the upcoming XXII SHE 2017 International Conference on November 28 to December 1, 2017. 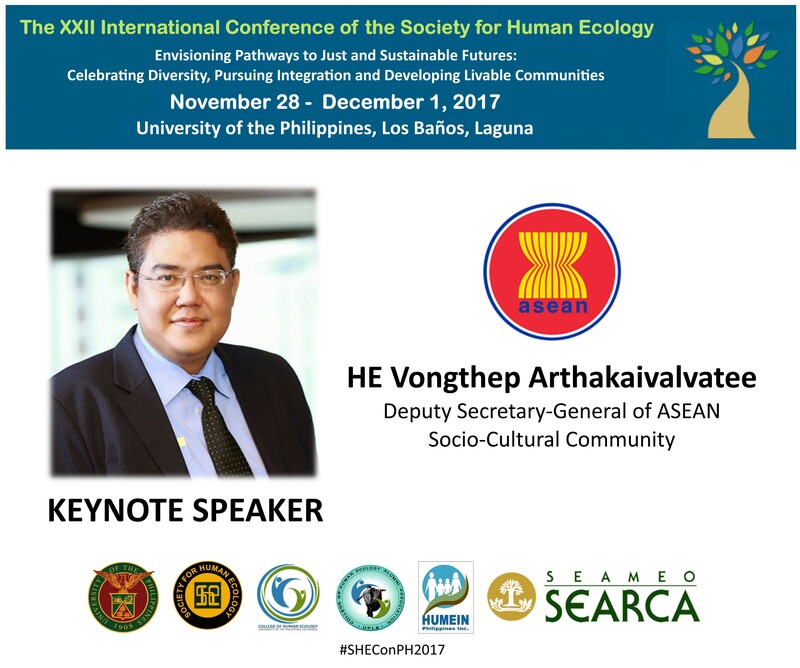 This will be the first time that the Society for Human Ecology international conference will be held in the ASEAN region where past SHE conferences were held in USA, Australia, and United Kingdom. 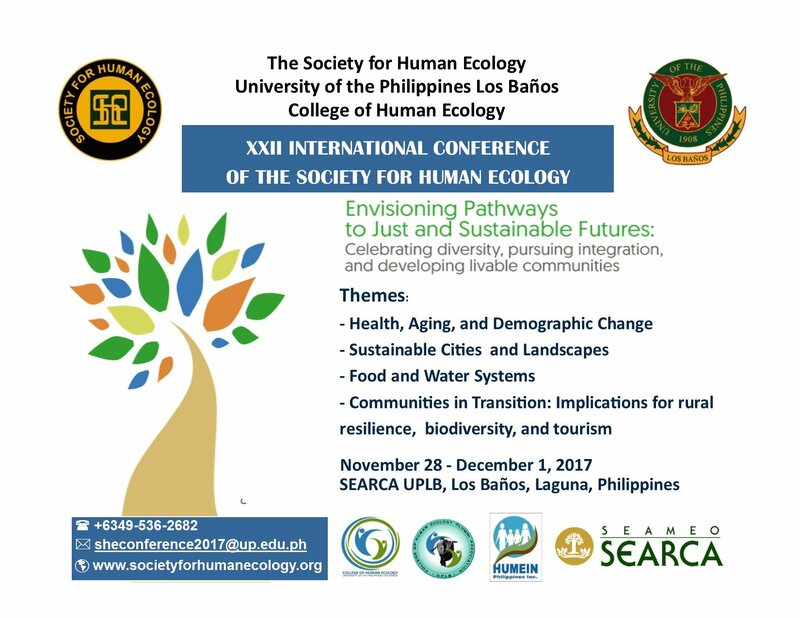 This year, the College of Human Ecology of the University of the Philippines Los Baños in partnership with the Society for Human Ecology (SHE), and the International Organization for Human Ecology will host the said conference. The main message of the Conference will be delivered by distinguished speakers lead by the Keynote address of His Excellency Deputy Secretary General Vongthep Arthakaivalvakatee of the Association of Southeast Asian Nations (ASEAN). Plenary speakers covering the conference themes will include Mr. Ranell Dedicatoria (Sustainable Cities and Landscapes) from ICLEI Southeast Asia – Local Governments for Sustainability, Dr. Stacy Jupiter (Sustainable Food and Water Systems ) Director at Wildlife Conservation Society, Ms. Gina Lopez (Communities in Transition) Environmental Advocate and former DENR Secretary of the Philippines, and Dr. Tony Capon (Health and Aging) Inaugural Professor of Planetary Health at University of Sydney. 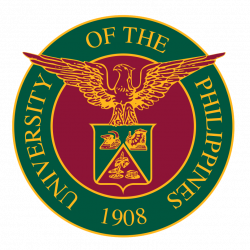 The venue for the Conference is the Southeast Asian Regional Center for Graduate Study and Research in Agriculture (SEARCA), one of the main conference partners, which is within the University of the Philippines Los Baños Campus. It is located about 66 kilometers south of Manila and is nestled at the foot of the majestic Mt. Makiling. Hosting a community of research and academic institutions such as SEARCA, International Rice Research Institute (IRRI), ASEAN Center for Biodiversity (ACB), Ecosystem Research and Development Bureau (ERDB), Philippine Rice Research Institute (Philrice), the UPLB campus boast of vibrant yet peaceful and serene community life.